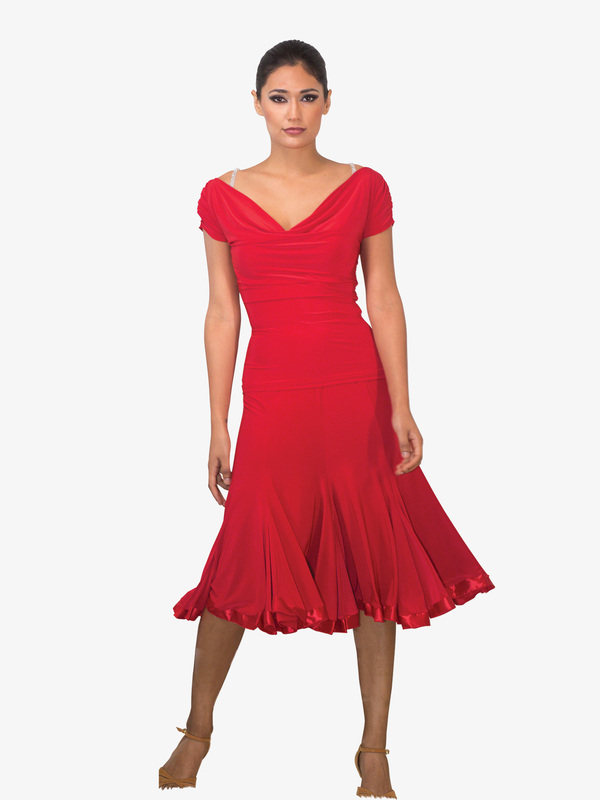 Most popular DANCE AMERICA ballroom dance clothing styles including dresses, skirts, and tops. Dance America Womens Back Cutout Long Ballroom Dance Dress D803: A must-have dazzler! This irresistible dress features a boat neck front, 3/4 sleeves, multiple stunning back cutouts with rhinestone embellishment detail, and an attached, long, flared out skirt. Briefs and rhinestone bra straps not included. Dance America Womens Back Cutout Short Ballroom Dance Dress D802: A must-have dazzler! This irresistible dress features a boat neck front, 3/4 sleeves, multiple stunning back cutouts with rhinestone embellishment detail, and an attached, short, flared out skirt. Briefs and rhinestone bra straps not included. Dance America Womens Boot Cut Ballroom Dance Pants P801: Accentuate your elegant, clean lines with this pair of practice pants by Dance America. Pants feature a slim, boot cut leg, and moisture-wicking fabric. 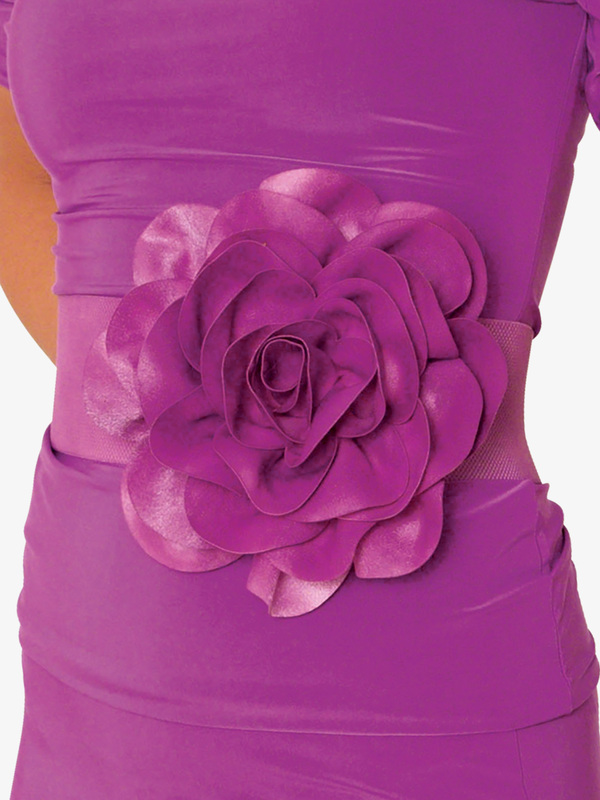 Floral belt sold separately. Dance America Womens Off-The-Shoulder Striped Ballroom Dance Top T824: Add a splash of color to your ballroom ensemble with this accented top - featuring an off-the-shoulder neckline, short sleeves, and a contrast neckline stripe. Rhinestone bra straps not included. Dance America Mens Striped Long Sleeve Ballroom Leotard MS21: Add dimension to your ballroom costume with these long sleeve leotard featuring a mandarin collar, functional front zipper, and side and back panel mesh stripes inserts. Dance America Womens Gathered Back Keyhole Ballroom Dance Tank Top T818: Amp up the heat in this sassy ballroom top - featuring tank straps, a v-front with a rhinestone ring embellishment, front and back cinched detail, and a subtle back cutout. Dance America Womens Draped Yoke Short Sleeve Ballroom Dance Top T806: An elegant top made to compliment your elegant moves! This simple yet flowing top features gathered short sleeves, a boat neck with drape detail, and moisture-wicking fabric. Rhinestone bra straps not included. 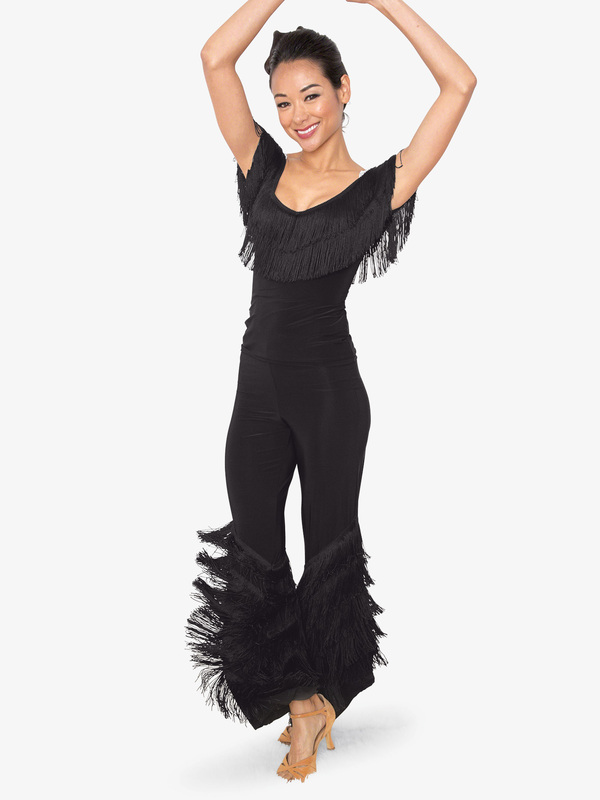 Dance America Womens Mid-Length Palazzo Ballroom Dance Pants P803: Bold and comfortable, these palazzo pants feature an upgraded waistband with a higher rise than the older style, and a midi, mid-width flared leg. Briefs not included. Dance America Womens Reversible Cascade Ballroom Dance Top T825: Change up your look without changing your top! This top features an off-the-shoulder neckline, short sleeves, an interchangeable, ruffled arm tie, and best of all, top is fully reversible! Ruffled tie can be tied to either side. Rhinestone bra straps not included. Dance America Womens Cirrus Short Sleeve Ballroom Dance Top T821: Complimenting your graceful and elegant moves - this flowy top features a v-front that sits slightly off the shoulder, a front and back asymmetrical, sheer mesh overlay that flows with movement, and a v-back. Rhinestone bra straps not included. Dance America Womens Drawstring Off-The-Shoulder Ballroom Dance Top T819: Create a dramatic look with this elegant top - featuring an off-the-shoulder neckline, drawstring shoulders, and long sleeves. Rhinestone bra straps not included. Dance America Womens Cut Out Long Sleeve Ballroom Dance Top T813: Dare to bare a little! This stunning top features long sleeves with multiple, eye-catching cutouts, a front keyhole, and a back keyhole. Dance America Womens Palazzo Ballroom Pants DP703: Designed with a more classic silhouette these full-length palazzo pants are comfortable yet elegant! Dance America Womens Lace Black Long Sleeve Ballroom Dance Top T823: Elegant yet daring, this Dance America top features floral lace long sleeves, a front floral lace insert, a sweetheart bodice, and a plunging, floral lace back. Rhinestone straps not included. 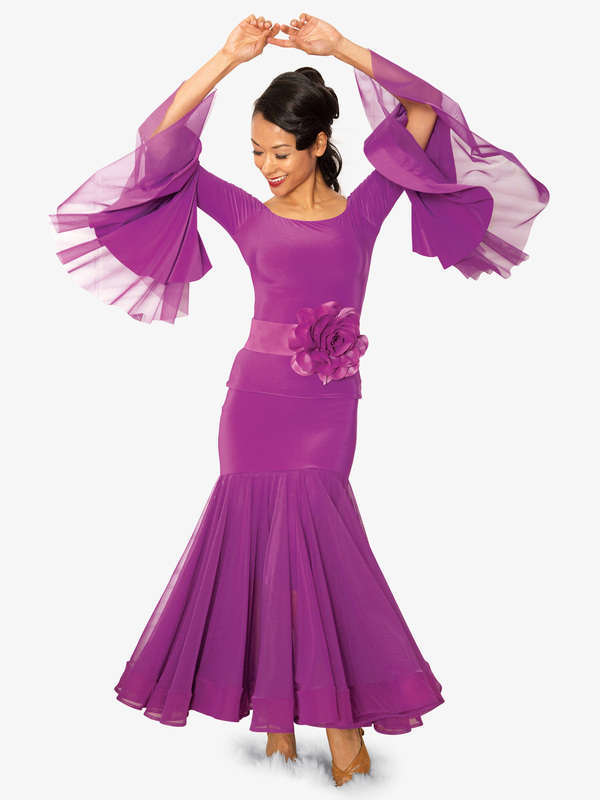 Dance America Womens Latin Fiesta Asymmetrical Ballroom Dance Dress D805: Elegant yet full of fun details, this stunning dress features a single butterfly sleeve, an asymmetrical, ruffled hem, and side flounce detail. Rhinestone bra straps and briefs not included. Dance America Womens Draped Lace Back Long Ballroom Dance Dress D813: Elegantly chic, this gorgeous dress features tank straps, a floral lace back insert, a cowl back, and an elongating long length. Briefs not included. Dance America Womens Cowl Neck Long Sleeve Ballroom Dance Top T814: Elegantly designed, this ballroom top features a cowl neck front, long sleeves, and gathered side detail. Floral belt sold separately. Dance America Womens Fringe Long Sleeve Ballroom Dance Dress D812: Every shimmy will be accentuated with this fringe dress - featuring a boat neck front, long sleeves, a gathered waist with rhinestone embellishment detail, and three layers of light-capturing fringe. Briefs not included. 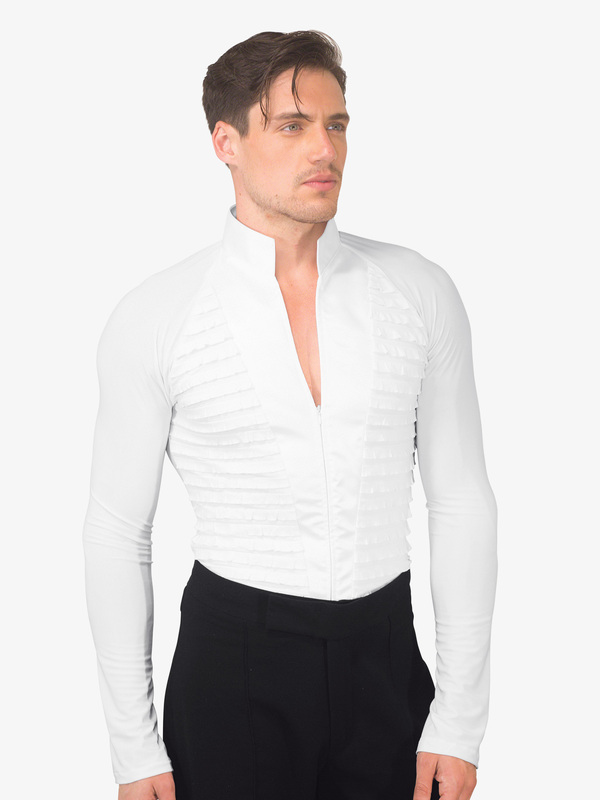 Dance America Mens Mesh Insert Ballroom Leotard MS34: Eye-catching long sleeve top features a shirt collar, center snap button closures, geometric patterned mesh sleeves, geometric patterned front insert, and attached briefs. Dance America Mens Collared Long Sleeve Ballroom Leotard DMS19: Feel confident as you guide your dance partner in this long sleeve leotard featuring a shirt collar, button snap closures, sheer mesh striped shoulder inserts, sheer mesh striped back panel, and attached briefs. Dance America Mens Collared Long Sleeve Ballroom Top MS25: Feel the rhythm as you dance in this long sleeve top featuring an oversized shirt collar, button snap closures down the center, and wavy patterned inserts. Dance America Womens Boat Neck 3/4 Sleeve Ballroom Dance Top T801: Flaunt your elegant, clean lines with this slimming top - featuring a flattering boat neck, and 3/4 sleeves. Rhinestone bra straps and floral belt not included. Dance America Womens Damoiselle Short Sleeve Ballroom Dance Top T815: Flirty and feminine, this playful top features a mock neck, a front and back sheer mesh insert, a ruffled front overlay, short sleeves, and a back keyhole with a small tie detail. Rhinestone bra straps and floral belt not included. Dance America Womens Off-The-Shoulder Bell Sleeve Ballroom Dance Top T817: Float on stage in this light and airy top - featuring an off-the-shoulder neckline, exaggerated mesh, bell sleeves, and moisture-wicking fabric. Floral belt sold separately. 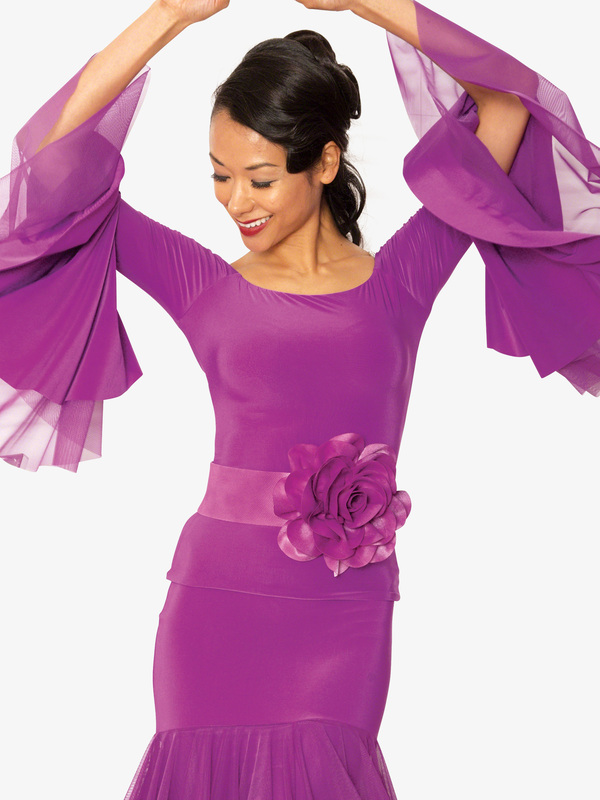 Dance America Womens Off-The-Shoulder Ballroom Dance Top T802: Get your body moving and grooving in this loose style ballroom top - featuring an exposed shoulder, ruched dolman half sleeves, and moisture-wicking fabric to keep you cool as you get your cha-cha on. Rhinestone bra straps not included. Dance America Womens V-Front Ruffled Long Sleeve Ballroom Dance Top T810: Giving you ultimate movement during practices and performances, this Dance America top features a v-front, long sleeves, multiple sleeve cutouts with rhinestone embellishments, and ruffled sleeve trim. Dance America Womens Sweetheart Mesh Long Ballroom Dance Dress D806: Grace the stage in this elegant number! Dress features mesh long sleeves with cuffs, a front and back powermesh yoke insert, a sweetheart bodice, and an attached long, flowing skirt with a flattering side slit. Briefs, rhinestone bra straps, and floral belt not included. Dance America Womens Sweetheart Mesh Short Ballroom Dance Dress D807: Grace the stage in this elegant number! Dress features mesh long sleeves with cuffs, a front and back powermesh yoke insert, a sweetheart bodice, and an attached short, flowing skirt. Briefs, rhinestone bra straps, and floral belt not included. Dance America Womens Straight Leg Yoga Ballroom Pants DP701: Head to practice in these slimming straight leg yoga pants made of moisture wicking fabric to help keep sweat away! Dance America Womens Strappy Fringe Ballroom Dance Camisole Top T826: Highlight every movement in this eye-catching top - featuring camisole straps, a crisscross v-front, and multiple layers of light-catching fringe. Rhinestone bra straps not included. 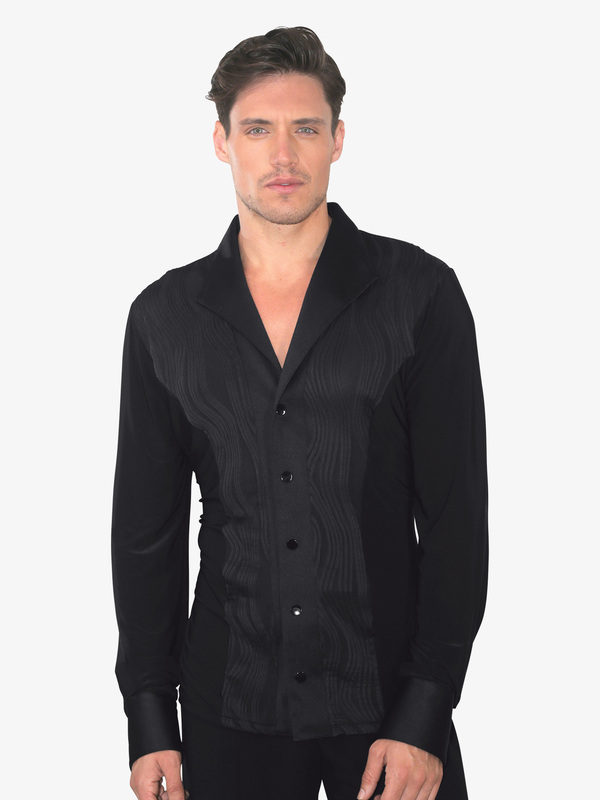 Dance America Mens Mandarin Collar Ballroom Top MS28: Look sharp and polished in this long sleeve top featuring a mandarin collar, zipper front closure, and tuxedo style front ruffle inserts. Dance America Mens Ruffled Long Sleeve Ballroom Top MS8A: Look suave in this long sleeve leotard featuring a shirt collar, button snap closures down the center, and a ruffled front insert. Dance America Womens Asymmetrical Triple Strap Ballroom Dance Top T803A: Make a daring entrance in this bold ballroom top - featuring a single, oversized angel sleeve, a triple tank strap with an attached rhinestone ring accent, and moisture-wicking fabric. Dance America Womens Gathered Waist Palazzo Ballroom Dance Pants DAP802: Make a statement in these bold palazzo pants - featuring an adjustable, gathered waistband, and a mid-width palazzo silhouette. Briefs not included. Dance America Womens Fresco Fringe Ballroom Dance Top T822: Nothing says Salsa like a fringe top! Top features a flattering v-front that sits slightly off-the-shoulder, two layers of fun fringe, and a v-back. Rhinestone bra straps not included. Dance America Womens Lace Long Sleeve Ballroom Dance Top T808: Offering a highly sophisticated look, this elegant top features a mock neck, floral lace long sleeves, front and back floral lace inserts, and a subtle back keyhole with a tie that can be worn as a fashionable bow or shawl. Rhinestone bra straps not included. Dance America Womens Ruffled Baby Doll Ballroom Dance Dress D815: Perfect for practice or performance - this adorable dress features a single, rhinestone camisole strap, an asymmetrical front, double-layered ruffle detail, and an underskirt lining. Additional rhinestone bra straps and briefs not included. Dance America Womens Mesh Butterfly Ballroom Dance Top T820: Providing a beautiful, floating silhouette, this ballroom top will make you look like you are floating on air! Top features a v-front, front and back sheer mesh inserts, sheer mesh butterfly sleeve overlay, a front keyhole, and moisture-wicking fabric. Dance America Womens Draped Mesh Back Short Ballroom Dance Dress D814: Put on your dancing shoes and get ready to stun the audience! Dress features tank straps, a sheer mesh back insert, a cowl back, and an asymmetrical, two-layer ruffled hem. Briefs not included. Dance America Womens Back Cutout Long Ballroom Dress D703: Sashay the night away in this classic 3/4 sleeve dress featuring a wide boatneck, multiple back cutouts detailed with rhinestones, and an attached long flowy godet skirt. Dance America Womens Back Cutout Short Ballroom Dress D702: Sashay the night away in this classic 3/4 sleeve dress featuring a wide boatneck, multiple back cutouts detailed with rhinestones, and an attached short flowy godet skirt.Rhinestone bra straps not included. Dance America Womens Rhinestone Cutout Long Sleeve Ballroom Dance Top T809: Sassy cutouts and a body-contouring silhouette - what more could you want in a ballroom top! Top features a v-front, long sleeves, multiple sleeve cutouts with rhinestone embellishments, and a v-back. Dance America Womens Wrap Off-The-Shoulder Ballroom Dance Top T807A: Simple yet striking, this ballroom top features an off-the-shoulder neckline, a wrap front, and moisture-wicking fabric. Rhinestone bra straps not included. 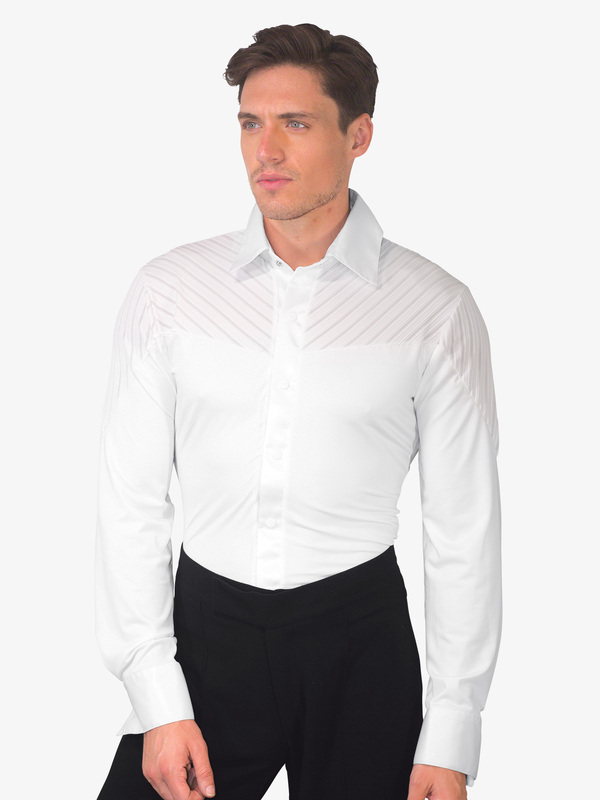 Dance America Mens Striped Side Ballroom Top MS29: Sophisticated long sleeve top features an oversized collar, center button snap closures, and mesh striped panels. Dance America Womens Cold Shoulder Dolman Sleeve Ballroom Dance Top T811: Sparkling details and a comfortable silhouette are just what you need for a perfect performance! Top features rhinestone embellished straps, shoulder cutouts, comfortable dolman half sleeves, and a banded hem. 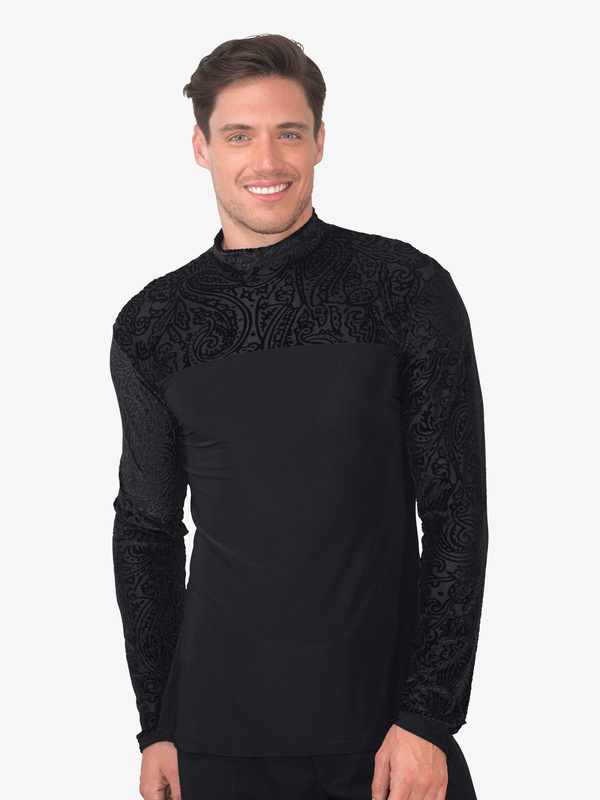 Dance America Mens Mock Neck Velvet Front Ballroom Top MS32: Sweep your partner off their feet in this long sleeve top featuring a mock neck, velvet burnout sleeves, front and back velvet burnout inserts, and a solid colored bodice. Dance America Womens Jackie Halter Ballroom Dance Dress D804: Take your hip-swaying to the next level in this fun and flirty dress - featuring a blouson halter front, a tie back, a gathered waistband, and an attached, short skirt. Briefs and rhinestone bra straps not included. Dance America Mens Long Latin Pants MP1: These classic Latin pants are a must-have for any level ballroom dancer!Pants are unhemmed. Dance America Mens Faux Leather Detailed Latin Pants MP4: These Latin pants are a staple and can easily be mixed and matched with any ballroom basics! Features include a longer rise, wide leg, faux leather stitched accents, and a 36-inch inseam.Pants are unhemmed. Dance America Mens V-Neck Faux Leather Insert Ballroom Leotard MS36: This bold leotard features a V-front with faux leather trim, long sleeves, faux leather shoulder inserts, and attached briefs. Dance America Womens Diagonal Mesh Cape Ballroom Dance Top T812: This bold top features tank straps, and a sheer mesh cape overlay. Perfect for practice or performances! Dance America Womens 3/4 Sleeve Ballroom Leotard L701: This classic 3/4 sleeves leotard features a wide scoop front, low cut leg lines to prevent leotard from riding up, and made of moisture wicking material.Rhinestone bra straps sold separately. Dance America Womens Square Front Long Ballroom Dance Dress D808: This flowy dress gives you all the volume you want without sacrificing any of the comfort! Dress features a unique square front, long sleeves, a gathered waist with a rhinestone embellishment, and an attached long, flowing skirt with a wide crinoline trim. Briefs not included. 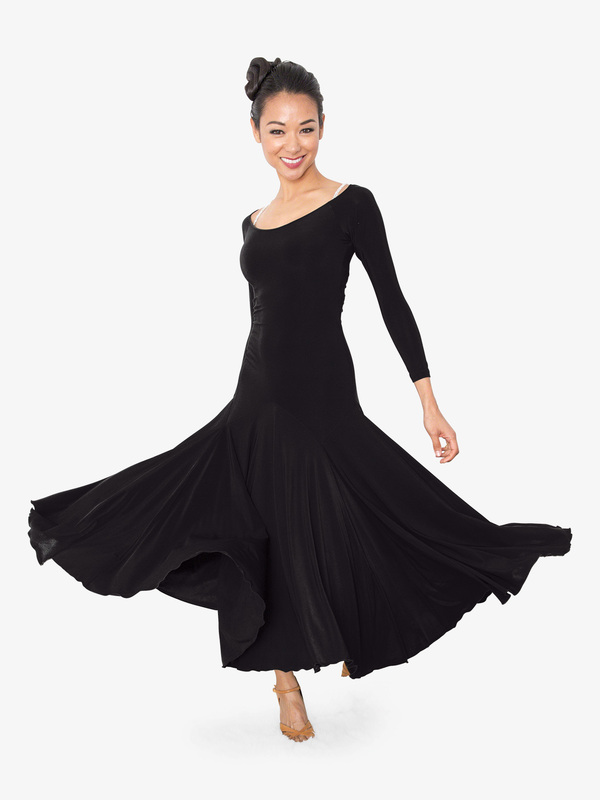 Dance America Womens Square Front Short Ballroom Dance Dress D809: This flowy dress gives you all the volume you want without sacrificing any of the comfort! Dress features a unique square front, long sleeves, a gathered waist with a rhinestone embellishment, and an attached short, flowing skirt with a wide crinoline trim. Briefs not included. Dance America Womens Jackie Mock Neck Halter Ballroom Dress D704: This sophisticated halter dress features a mock neck, flowy tie at the neck, flattering ruched waist, and an attached flowy skirt.Rhinestone bra straps not included. 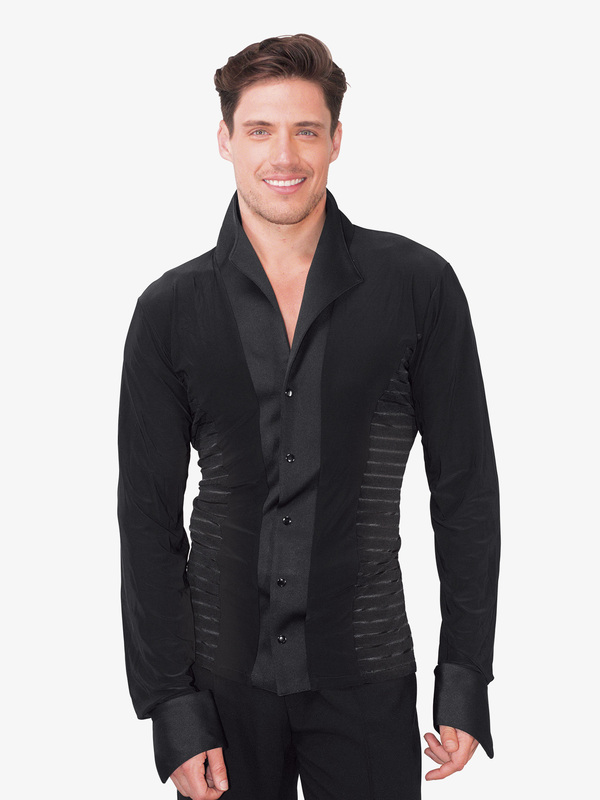 Dance America Mens Belted Long Sleeve Ballroom Top MS27: This stylish kimono style top features a satin collar, long sleeves, center button snap closures on a satin panel, and an attached satin belt. Dance America Mens Snap Closure Ballroom Vest MV1: Top off your ballroom dancewear with this classic vest featuring a center front snap closure. .Shirt not included. Dance America Womens Angelica Long Ballroom Dance Dress D810: Turn heads as you enter center stage in this extremely elegant dress! Dress features a mock neck, floral lace long sleeves, floral lace front insert, a sweetheart bodice with floral lace overlay, full-length princess seaming, back button closure, a subtle back keyhole, a ruched saddle, and a flared out, floral lace hem. Rhinestone bra straps and briefs not included. Dance America Womens Angelica Short Ballroom Dance Dress D811: Turn heads as you enter center stage in this extremely elegant dress! Dress features a mock neck, floral lace long sleeves, floral lace front insert, a sweetheart bodice with floral lace overlay, full-length princess seaming, back button closure, a subtle back keyhole, a ruched saddle, and a flared out, floral lace hem. Rhinestone bra straps and briefs not included. 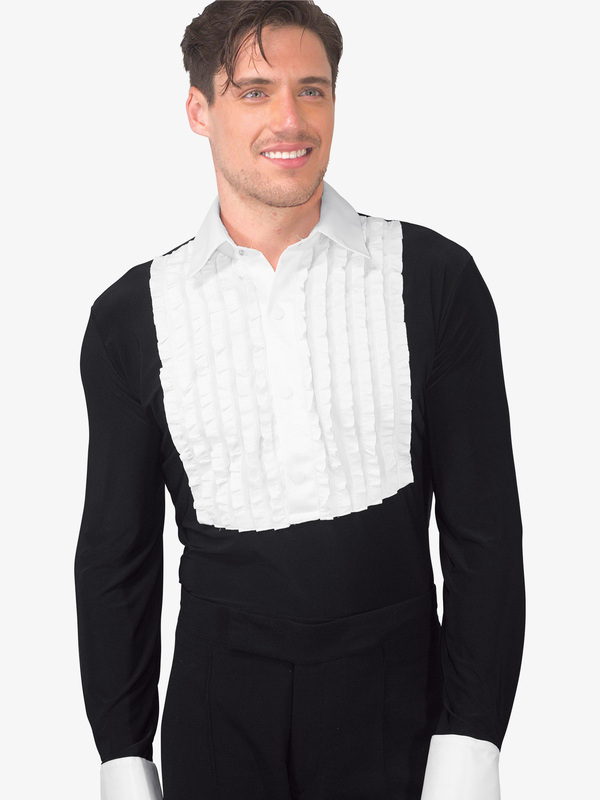 Dance America Mens Ruffled Tuxedo Style Ballroom Leotard MS33: Tuxedo style leotard features a shirt collar, long sleeves with white trim, front ruffled insert, and attached briefs. 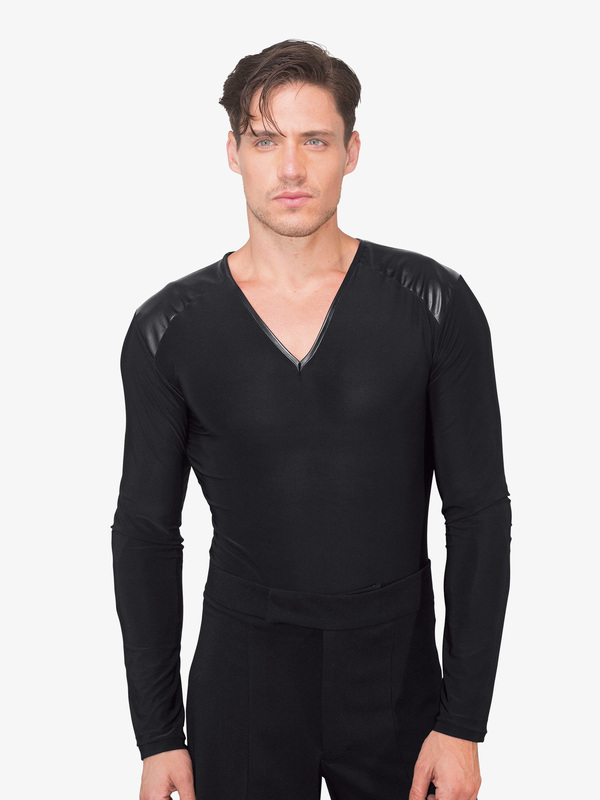 Dance America Mens Mesh Wrap Ballroom Top DMS18: Wow the audience in this long sleeve wrap top featuring allover sheer mesh, solid colored trim, and a satin belt.Undershirt not included. More Dance America styles at Discount Dance Supply.